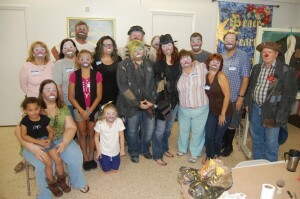 Learn the proper application of clown makeup at Fun World’s CLOWN SCHOOL! Learn the proper way to put on makeup for the major clown styles: Whiteface, Auguste and Character, the most popular of which is Tramp/Hobo. You’ll learn the properties and characteristics of grease paint, the proper application, care and removal. Which style you carry on to graduation is entirely up to you! Sign up today for Fun World Clown Alley’s “Clowning Essentials” clown school. 14 weeks of everything you need to know to get started. Or, you can brush up on your skills and gain valuable experience in front of an audience! Classes start at the end of this month! ← Find Your Inner Clown at Clown School!